There is a simple, tangible way to understand the positive change forged by the Kansas City Downtown Streetcar – it’s in the parking lot that was and is no longer. Right along the streetcar corridor, there is a block that for five decades sat untouched as parking lot. And as soon as the city announced the streetcar project was funded and ready to go? 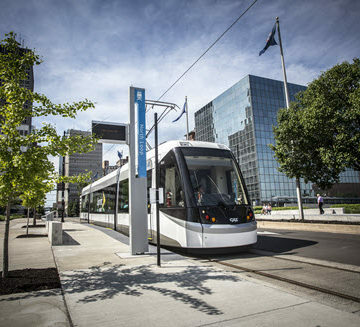 ASCE has honored the Kansas City Downtown Streetcar with the 2017 Innovation in Sustainable Engineering Award for providing Kansas City with an economically, socially, and environmentally sustainable transportation solution made possible by innovative technology and dedicated collaboration. Before the streetcar, Kansas City residents could use the bus system to get to and from downtown but lacked a mode of transportation for shorter trips within the area. Wide streets and few buffers between pedestrians and vehicles discouraged downtown pedestrian traffic. The city sought a way to better achieve the goals specified in its Greater Downtown Area Plan – including increased walkability, connectivity, and mixed-use development. 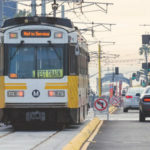 Since it began operating in 2016, the streetcar has not only satisfied the need to connect existing neighborhoods, it’s also kick-started further development in those areas – not just that old parking lot. McIntyre cited an additional 3,500 apartments in the Transportation Development District as part of a $1.7 billion in completed or planned construction in the area. The Kansas City system is the first commercially operating streetcar in the country to feature 100 percent low-floor vehicles – no steps or raised surfaces on the floors. This provides increased mobility for people using wheelchairs, bicycles, and strollers. Paired with level boarding – meaning no height difference between the platform surfaces and car floors – the streetcar opens the benefits of public transit to many who found it challenging to use it in the past. The project also earned the Envision Platinum award for sustainable infrastructure from the Institute for Sustainable Infrastructure. The project team designed and constructed the corridor to minimize, reuse, and divert waste from landfills, and to implement green infrastructure solutions. Concrete was removed from sidewalks, driveways, and pavement during construction, recycled into aggregate, and reused on the project. All scrap metal was recycled as well. One of the project’s most important innovations lay in the groundwork done before any design or construction – in the teamwork behind the funding mechanism. The streetcar topped 2 million rides in little less than a year of operation. And it’s increasing, so it’s not just a city novelty act. 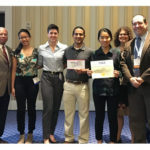 The ASCE Innovation in Sustainable Engineering Award recognizes a civil engineering project for its creativity in the form of innovative sustainability. Projects must demonstrate adherence to the principles of economic, social, and environmental sustainability. How long is the route? Two directions? Speed? Fares? Cost to build? Daily profit/losses? Only 5,500 riders per day? How many riders per mile? Who paid for it? I can’t believe that this streetcar justified putting up a big building. Sounds to me as if the streetcar is getting credit for something else. Please rewrite and let us know the whole story.